I'm so glad you've taken a moment to visit my site, and I hope you enjoy what you see. Feel free to contact me with questions or comments by email or on Facebook. I'm always happy to hear from you. AUGUST 4, 2018 Happy August! This month started with a large bang. My painting De-construction received a purchase award from the Fine Arts Festival organized by the Arts Council of Moore County! I had the pleasure of being present at the well-attended awards ceremony August 3. Still available at the Festival, Olde Carthage Barn (below) is 12x9 inches on panel. 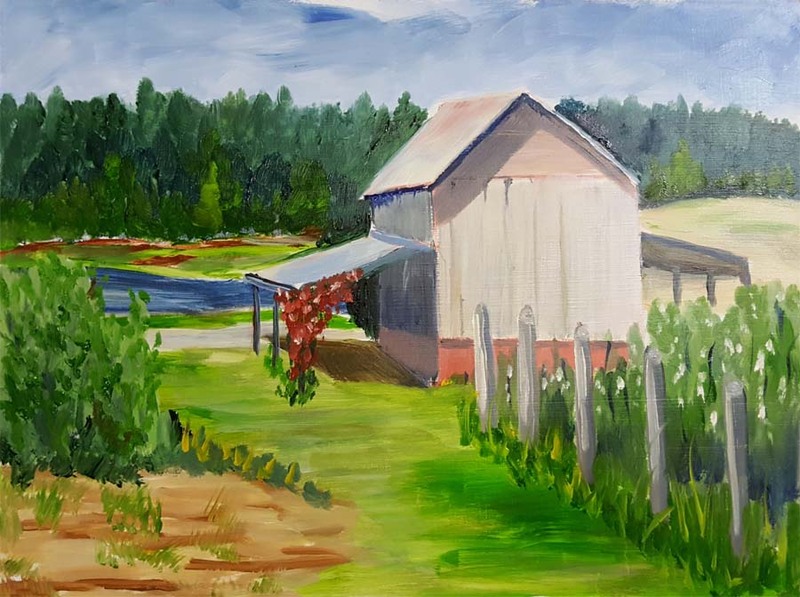 Both landscapes were painted in oil, en plein aire at Olde Carthage Farm. Many pieces of beautiful, intriguing, inspiring and exciting art are on view at the Campbell House. You'll want to fill your home and office with them. JULY 22, 2018 I'm happy to announce that my work is now represented by ARTworks Vass. ARTworks Vass is not only a gallery. It's also a classroom and a studio for three working artists. Stop in to enjoy the warm and welcoming atmosphere where kindred spirits gather for inspiration, creativity and conversation. Look for updates about classes and events on Facebook. You'll find Vass, NC, between Sanford and Southern Pines, just off US 1. That's a short drive from all points in Moore County and an hour south of Raleigh Durham International Airport. I invite you to visit our area. You'll love our art, dining, sightseeing, golf, horses and more. JULY 20, 2018 Two wonderful art events are coming up soon, and I'll have work in both. 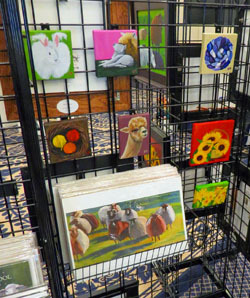 The Arts Council of Moore County will hold its annual Fine Arts Festival in August. 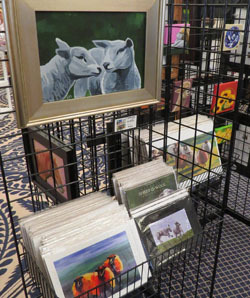 Created in 1980 as incentive for local artists to improve their techniques, it offers a showcase for the public to enjoy art and for artists sell their work. 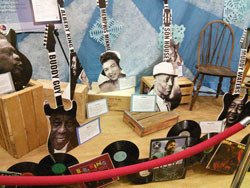 The festival has since grown into a major exhibit featuring artists from all over the US. 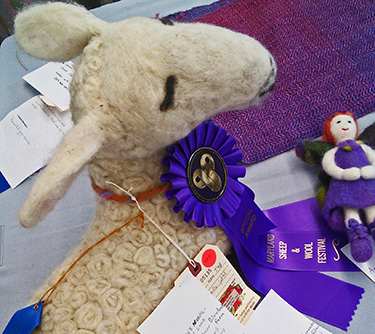 Entries are judged, and cash prizes and ribbons are awarded. 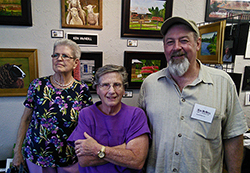 Also in August, The Artists Leagure of the Sandhills will open Small Gems of Art, a new exhibit featuring miniature and small works of art less than 8 x 10 inches. MARCH 18, 2018 Just a few days until Carolina FiberFest! Here's a preview of some paintings that will be looking for new homes. 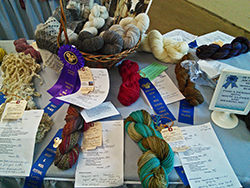 Carolina FiberFest is one big fiber party -- wool, silk, alpaca, llama, mohair, angora, plant fibers and more. From spinning yarn to knitting, crocheting, dyeing, felting, tatting and weaving, you’ll find it. Workshops, talks, demos, vendors, a raffle, contests. Make plans to be there! FEBRUARY 17, 2018 New mugs arrived today. What do you think? This mug design celebrates the breed of alpaca known as the huacaya. Its fleece is thick. dense and crimped, and very soft to touch. 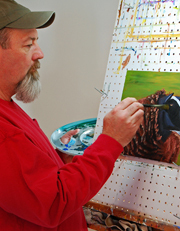 The fleece is prized by fiber artists for its light weight, excellent thermal qualities, and natural beauty. Alpaca fiber spins beautifully, knits up and crochets with a soft hand, and is perfect for your weaving or felting projects. The mug will be available for the first time at Carolina FiberFest in March 2018. FEBRUARY 14, 2018 Happy Valentine's Day! I finished the monster painting above in time to be a valentine for my wife. She loves it, and when she's happy, I'm happy! FEBRUARY 8, 2018 My new mug design celebrates the breed of alpaca known as the huacaya. This alpaca's fleece is thick. dense and crimped, and very soft to touch. The fleece is prized by fiber artists for its light weight, excellent thermal qualities, and natural beauty. With their floppy furry tufts, long slender necks, and big eyes, huaycayas are just the cutest, don't you think? Visit Carolina Alpaca Breeders and Owners for more info and adorable pics. 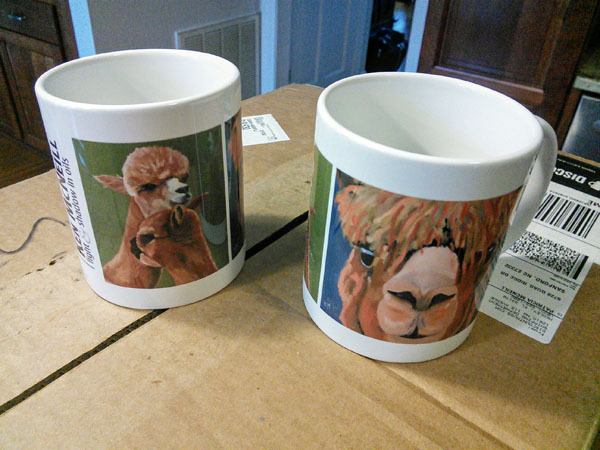 My alpaca mug will be availble for the first time at Carolina FiberFest, March 23 and 24 in Raleigh, NC. Get 'em before they're gone! ps - the painting in the previous post is finished, just in time for Valentine's Day! Fingers crossed that my wife will love it. JANUARY 29, 2018 We're already a month into the New year. Hope everyone's holidays were filled with joy, good food, fellowship and family. Hope you had good weather, too! Here in Sanford, NC, January brought unusually cold weather and two 7.5 inch snowfalls. I hope wherever you were and whatever weather you've had, you've been safe. Between snow-shoveling shifts, I made more progress on the monster painting you see above. It is 60 inches x 40 inches and will hang above our fireplace when finished. It's my largest painting to date. 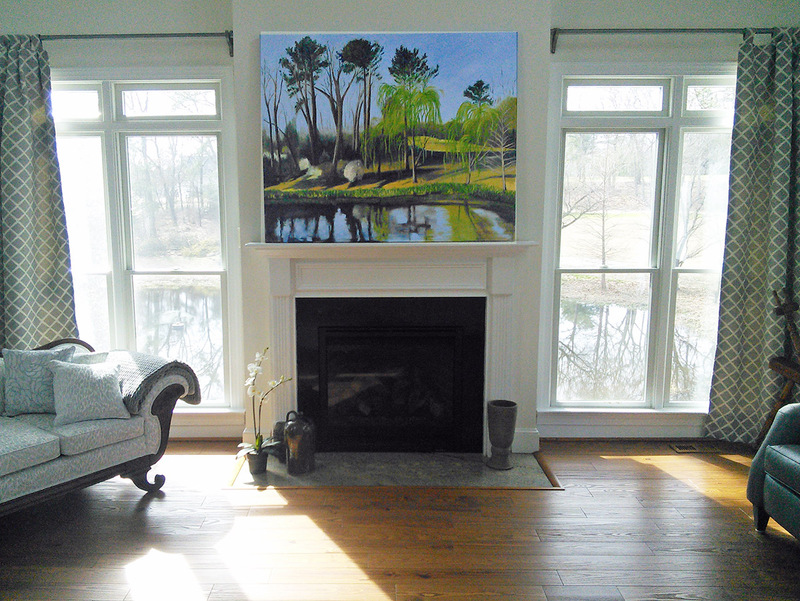 This painting depicts a view from our living room. 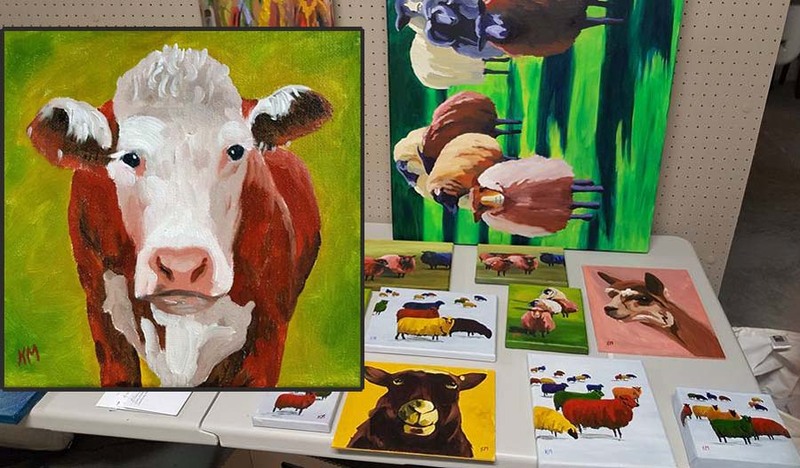 Rounding out the end of 2017 was SAFF, Sanford Brush and Palette Club 53rd annual art show and Artists League of the Sandhills fall show. All three events were great! Thank you all for the wonderful support you've given at these events and others over the years. You're the reason I do these shows. I'm excited about having my work in another gallery, the Miller Art Gallery in the Mann Center of North Carolina. 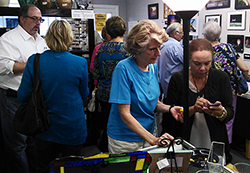 Located in Sanford, the Miller Gallery showcases the best of local and regional artists of all media including pottery, glass, jewelry, wood, metal, fiber and more. Stop by and see the beautiful art. I'm also gearing up for Carolina FiberFest March 23 and 24. I'll have lots of new paintings, prints and a new mug design. 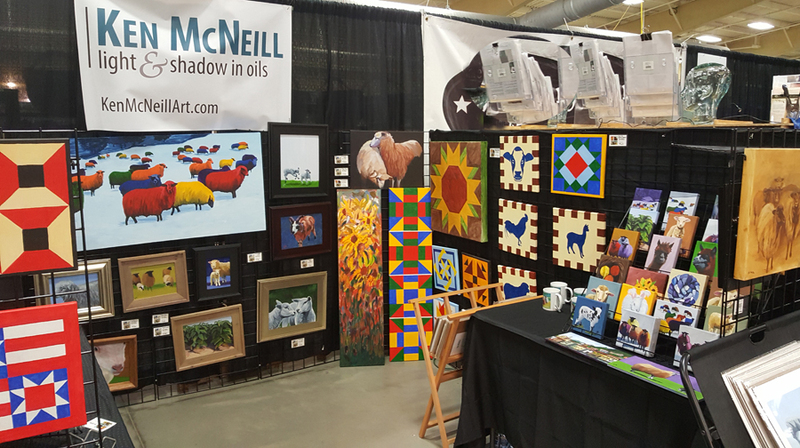 OCTOBER 27, 2017 SAFF (Southeastern Animal Fiber Fair) opens today and runs through Sunday, October 29. If you're in the Asheville area or want to make a road trip, please come on by. 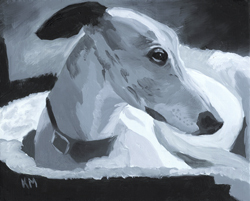 I've doubled my booth space this year and have many new paintings, prints and notecards. Look forward to seeing you!! OCTOBER 16, 2017 It's been a blitz to get paintings started, paintings finished, cataloged, framed, photographed and wired for hanging. I have three major events coming up, starting with the Sanford Brush and Palette Club fall show. I'll have close to 30 paintings there. 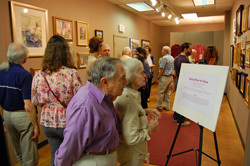 The show will run from Friday, October 20 through Saturday, October 28 at the Hale Center in Sanford, NC. 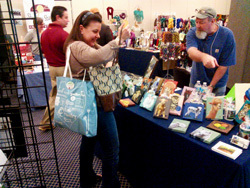 Next will be the Southeastern Animal Fiber Fair in Fletcher, NC (near Asheville). The show will run from Friday, October 27 through Sunday, October 29. I'll have a double booth to show off lots of new paintings! Following those will be the Artist League of the Sandhills Gallery fall show in Aberdeen, NC. This show will run from Friday, November 3 through Thursday, December 14. I'll have five paintings in the gallery and many more in my studio there. 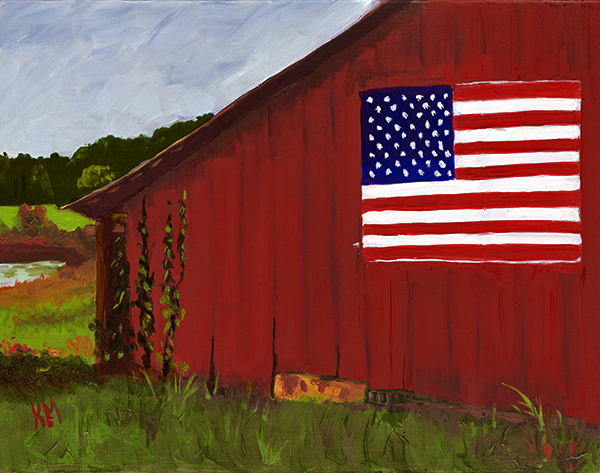 Additionally, I have two paintings in A Stroke of Patriotism, an art contest to benefit military veterans. With proceeds from previous years, A Stroke of Patriotism has disbursed funds to over thirty North Carolina Sandhills veterans to address a variety of needs, including building handicapped access to a home, assistance with adding in-home central air, college aid for a veteran attending culinary school, payment of excessive medical bills, local transportation and much more. Online voting is open through October 28. Support local artists! Support our veterans! SEPTEMBER 12, 2017 I'm adding a new notecard design to the collection. A detail of the painting Standoff went to the printer today. It will be available beginning in October at the Southeastern Animal Fiber Fair (SAFF). Hope you like it! AUGUST 29, 2017 Move-in Day! 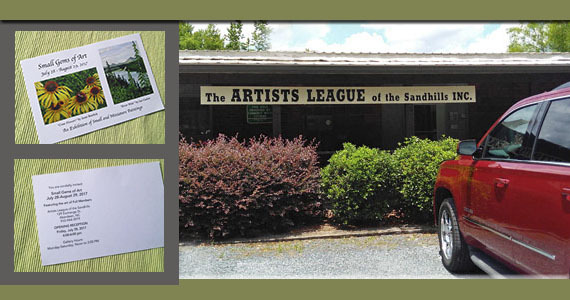 I'm very excited to be offered studio space by the Artists League of the Sandhills! Yesterday I hauled in furniture and art supplies. The artists extended a warm welcome, answering my questions about the working environment. Camaraderie with kindred spirits will be inspiring. I'm eager to spend time there! AUGUST 20, 2017 Last week I delivered new work to the The Liberty Artisan & Craft Gallery in Liberty, NC, which represents more than 100 artists and craftspeople. There, you'll find handmade baskets, garden sculpture, pottery, stained glass, jewelry, paintings and other original art. Enjoy a refreshing beverage while you shop for something special for yourself and for holiday gifts. 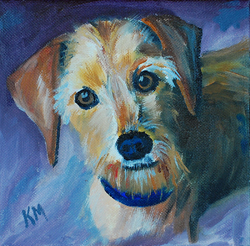 My paintings, prints, notecards and mugs are available. 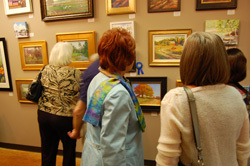 Located in the heart of North Carolina, the gallery is an easy drive from Greensboro, Asheboro, Sanford, Siler City and the Triangle area. AUGUST 15, 2017 This spring and summer have been even busier than usual. My post will be a long one, catching up with news (most recent first). 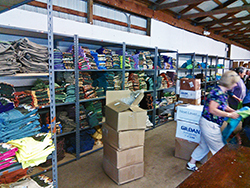 Get ready because Southeastern Animal Fiber Fair will be here in no time! This will be my fourth SAFF as a vendor. 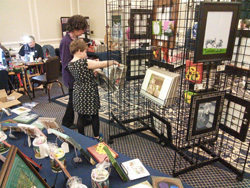 What makes SAFF a special event? It's crowds of fiber crazies, fiber fumes, the community of vendors, fiber animals, classes, fiber demos -- all in one location. Each year, I create something new, available for the first time during SAFF. 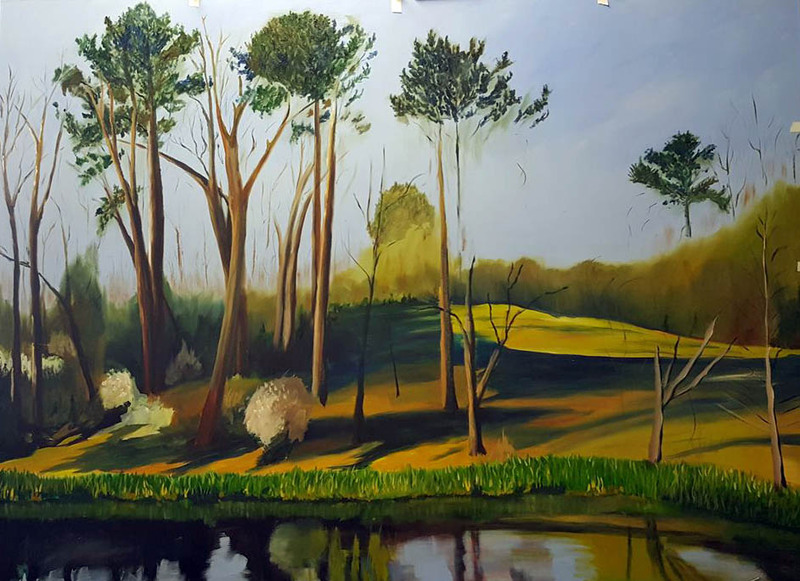 Since moving to Sanford, NC, this year, I've joined two artists' groups -- Sanford Brush and Palette Club and Artists League of the Sandhills. 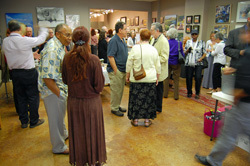 Both offer gallery shows, workshops and other ways for artists and art lovers to come together. 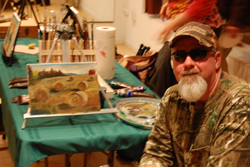 Sanford Brush and Palette Club puts on spring and summer Plein Air Paint Outs. 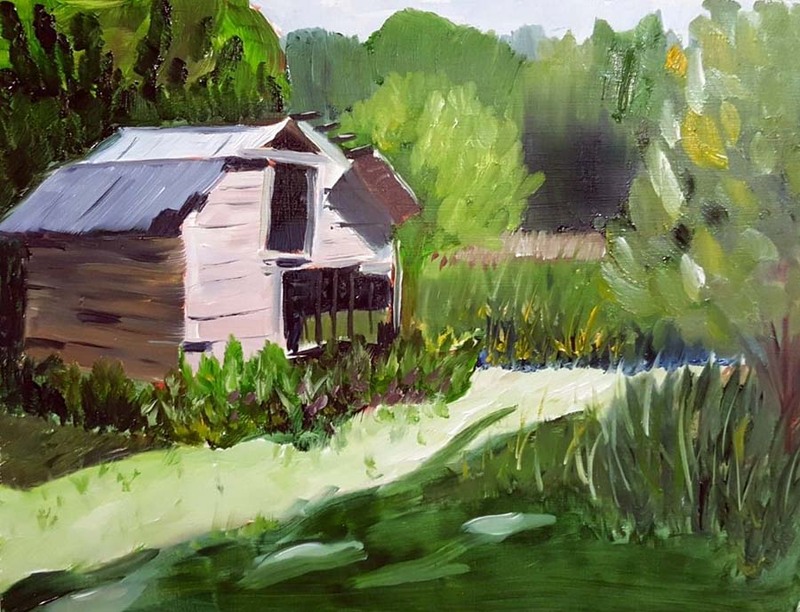 In April we spent a morning painting at a rustic farmhouse property, just the kind of landscape I love. In September, we'll take our brushes, paints and canvasses to Hawkins House a 100 year-old gem of Southern architecture. 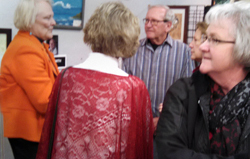 From October 21 through 28, the club will hold its 53rd Annual Art Show. 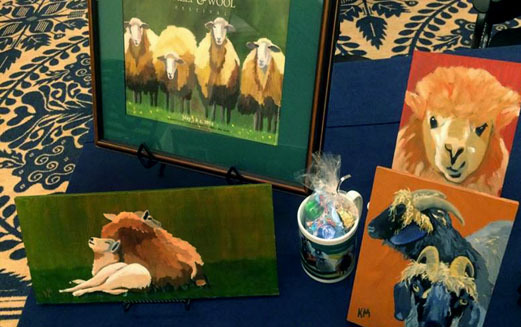 Hundreds of new, original pieces of art by club members will be on display. 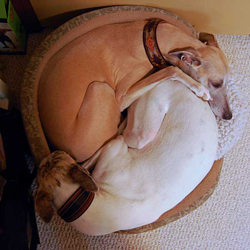 Plan to stay awhile! 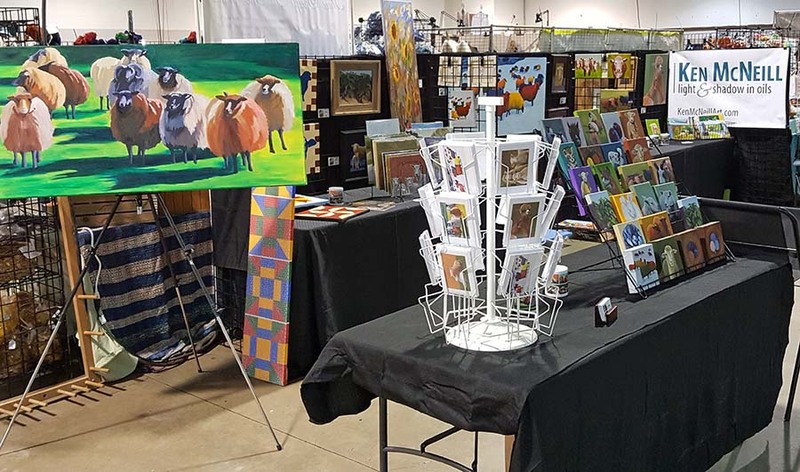 You'll want talk with artists, participate in demos, purchase art for your home or office, shop for upcoming holidays and just soak up the creativity. This event is free for all and is family-friendly. 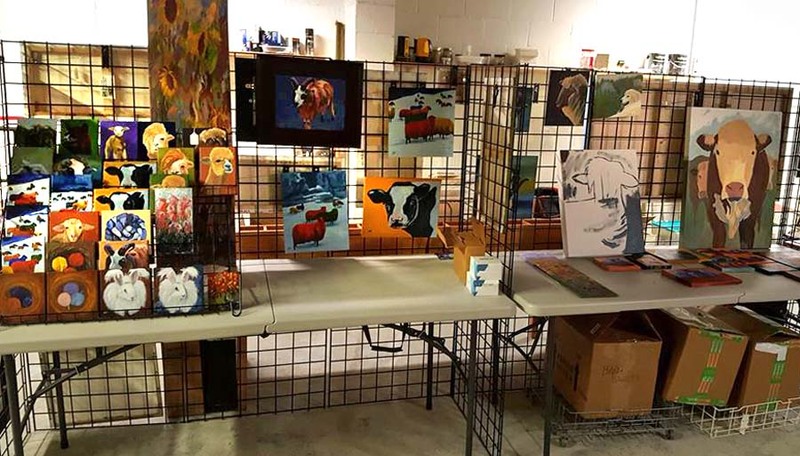 Artists League of the Sandhills (Aberdeen, NC) is home to gallery spaces, workshop spaces and artists working in a variety of media. In its open, studio environment, 40 artists collaborate and the public can engage with them and see, firsthand, the creative process in action. 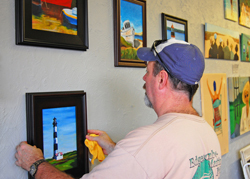 Events include an artist-of-the-month show, along with other juried and non-juried exhibitions. I have three paintings in a current show, Small Gems of Art: An Exhibition of Small and Miniature Paintings, running July 28 through August 29. Stop in and look around! 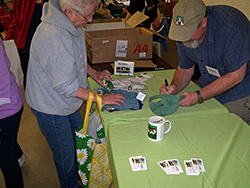 Carolina FiberFest 2017 was a wonderful event in March. 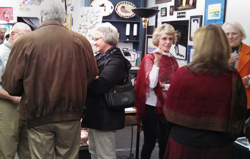 The new location, the Kerr Scott building was ideal with lots of space for visitors, vendors, classes, demos. Ample, close parking offered easy access to the building. 2017 was my first year having a double booth. It was perfect, with extra room for visitors to shop. No more bumping elbows. And thank you, CFF organizers for the great booth location! Plans for the 2018 event are well undeway, with a return to the Kerr Scott building. Thanks for hanging in there through this long post. Hope you've enjoyed it and hope to see you at an upcoming event! 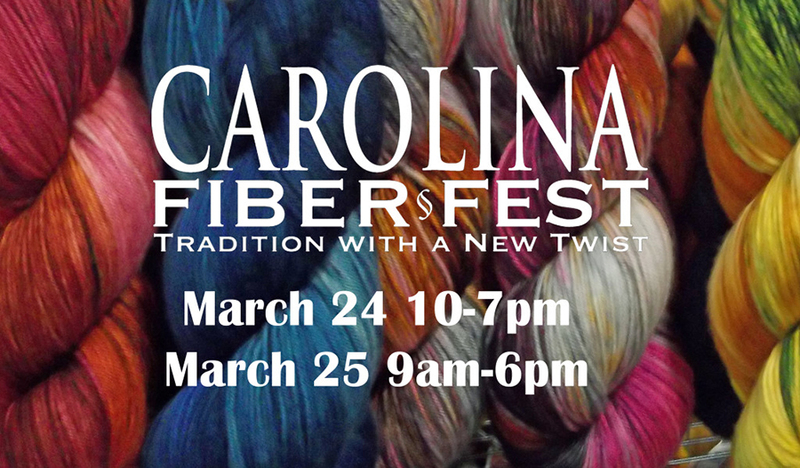 MARCH 21, 2017 Carolina FiberFest is three days out! I'm painting, painting, painting! As you see in the above pic, I'll have lots of fiber animals plus something different -- cows. Yes, cows. Ask me why when you visit my booth. 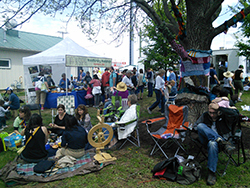 At Carolina FiberFest, you'll enjoy demonstrations of spinning, knitting, weaving, felting, crocheting, tatting and other fiber arts. Sign up for workshops, breathe fiber fumes and shop for beautiful and unique yarn, fiber, apparel and art. 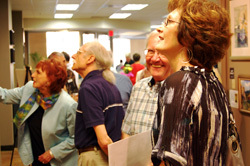 Attend free presentations.There's something for everyone. I'll be in booth 27, near the front door. Hope to see you there! JANUARY 18, 2017 2017! Where did 2016 go? It's been crazy time since SAFF took place last October. With the busy season of Thanksgiving, Christmas and winter birthdays, my family and I decided to ramp up the busy-ness. In December, we moved to my old stomping grounds of Lee County, North Carolina, to be closer to my (very) large extended family. Even now we're still unpacking boxes and finding things we didn't know we had. Sound familiar? It's all good, though, and I hope you had a wonderful holiday season with family and friends and FOOD! 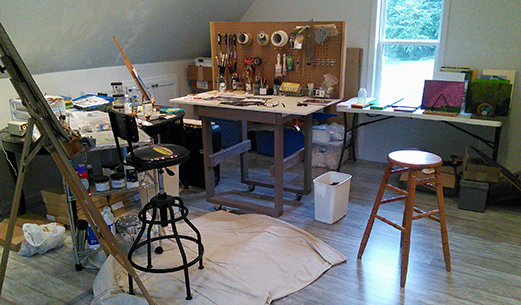 Last weekend I set up my studio to start new paintings for my next event, Carolina FiberFest. Thanks to the success of the 2016 event, CFF will take over the larger Gov. Kerr Scott Building at the NC State Fairgrounds. I'll have a double booth for the first time! OCTOBER 27, 2016 It's SAFF time! This will be my third SAFF as a vendor.What makes SAFF a special event? It's the crowds of fiber crazies, the fiber fumes, the community of vendors, the fiber animals, classes, fiber demos -- all in one location. 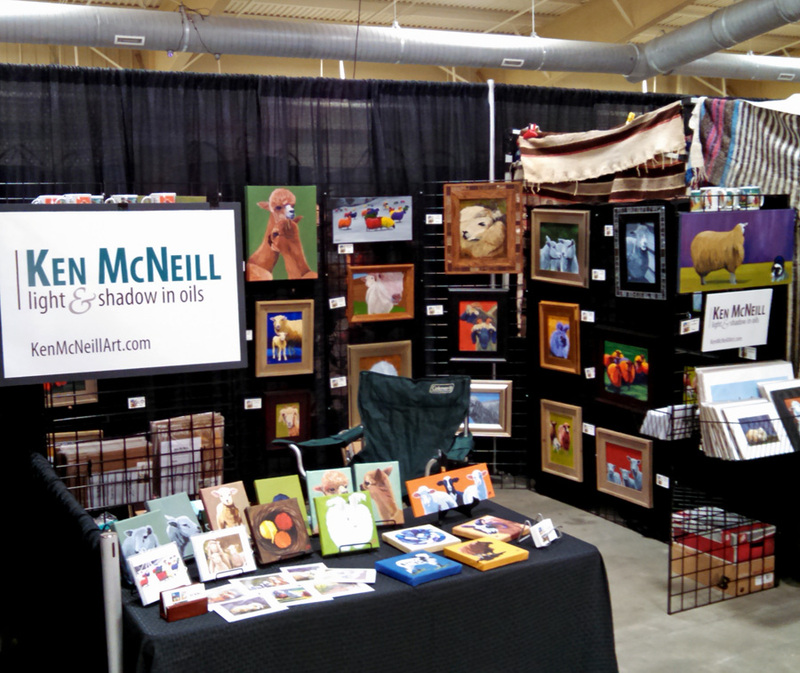 I put the final touches on my booth this morning, with paintings, prints, notecards and mugs. Each year, I create something new, available for the first time during SAFF. For 2016, I branched out into barn quilts for display in your home. Laying out the designs and painting them was great fun. I'll be hanging out in booth 204, the Davis Arena. Hope you'll stop by for a chat. 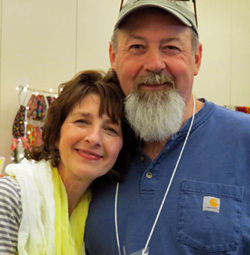 MARCH 17, 2016 My next event will be the tenth annual Carolina FiberFest! I'll have new paintings, prints and notecards for sale. 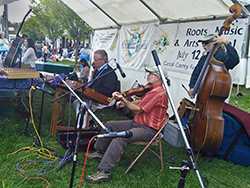 You'll enjoy demonstrations of spinning, knitting, weaving, felting, crocheting, tatting and other fiber arts. Sign up for workshops, breathe fiber fumes and shop for beautiful and unique yarn, fiber, apparel and art. Attend free presentations. 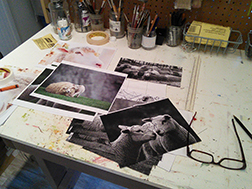 Buy tickets for chances to win raffle prizes, including three of my matted prints. JANUARY 1, 2016 As a new year begins, I'd like to express my sincere thanks to everyone who made 2015 a success. Whether you made a purchase, visited my website, liked a Facebook post, or encouraged me with a kind word, I appreciate your support. I'm excited to see how 2016 unfolds! NOVEMBER 2, 2015 Another great experience at SAFF! Many thanks to the organizers and volunteers who work to make this an excellent event. And special thanks to everyone who visited my booth to chat, to ask questions and to shop. You are the reason I do this. OCTOBER 30, 2015 SAFF is here! I put the final touches on my booth this morning. Would love to meet you. 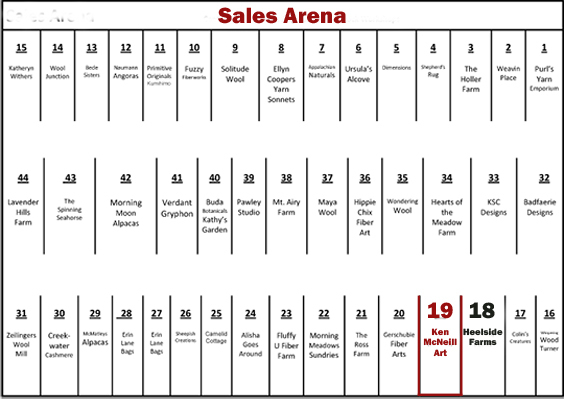 I'll be hanging out in booth 204, the Davis Arena. 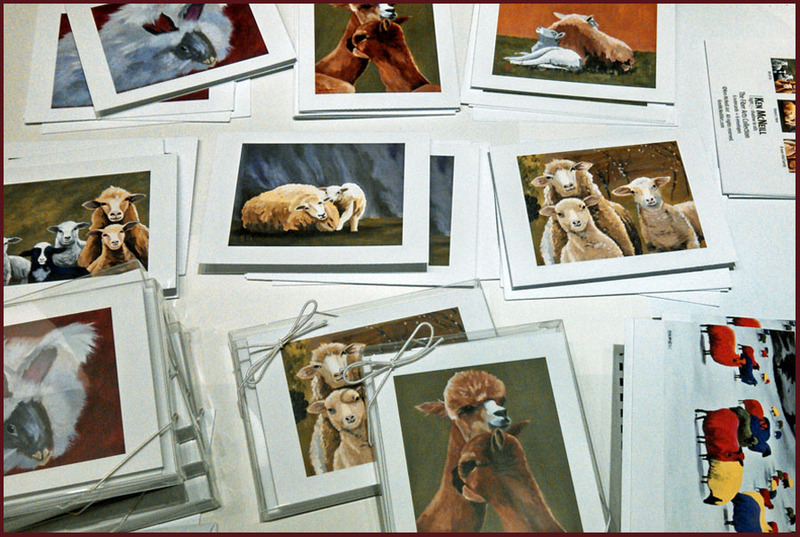 OCTOBER 27, 2015 Notecard assembly line. These boxed sets and individual cards are available for the very first time. Get yours at SAFF! OCTOBER 12, 2015 We're well into October and that can only mean one thing: SAFF is almost here! I'm in the studio, creating new paintings and prints just for SAFF. And I'll have the mugs and note cards you've been asking for. 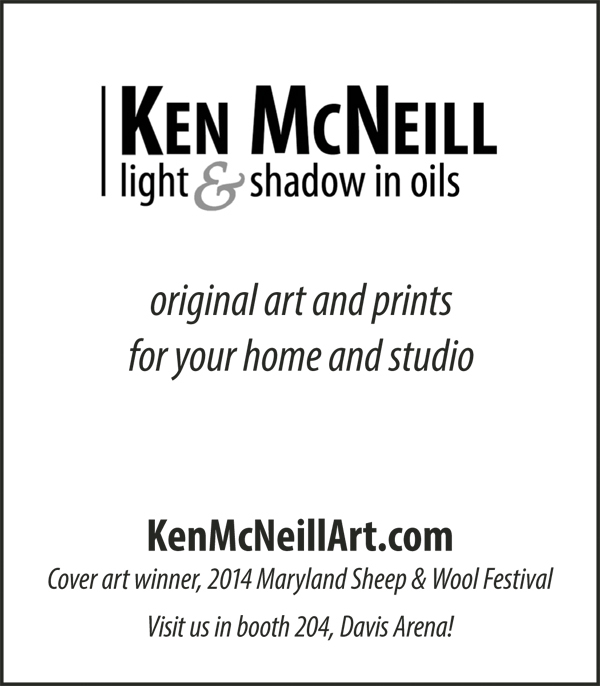 Look for my ad (pictured above in the SAFF program. 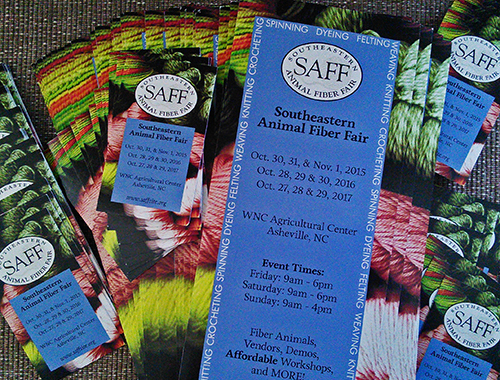 SEPTEMBER 23, 2015 My next event will be the 2015 SouthEastern Animal Fiber Fair (SAFF). I am pleased to return for a second year as a vendor during three days of fun for the entire family! 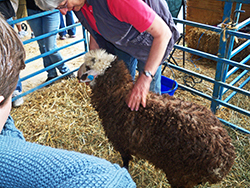 See spinning, knitting, weaving, felting, crocheting, along with fiber animals such as sheep, alpacas, llamas, goats and rabbits. 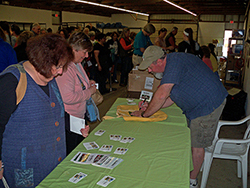 Sign up for workshops, breathe in fiber fumes and enjoy shopping for beautiful and unique yarn, fiber, apparel and art. 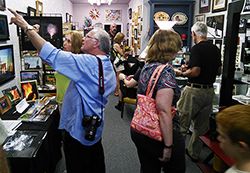 AUGUST 23, 2015 I would like to thank everyone who came out to my reception on August 14 at Artistic Expressions. 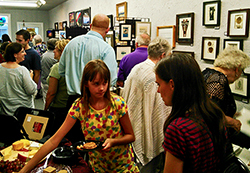 It was great to see the gallery buzzing with people enjoying the art, the fellowship and the great food. Congrats to the nine winners of the mug giveaway. Hope you all had a great time! Thanks for being there! You are cordially invited to an Artist Reception. 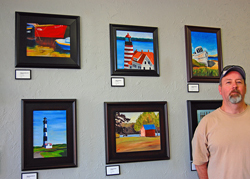 I'm the featured artist for the month of August at Artistic Expressions Gallery. Please join me this Friday for a reception with art, music and good eats. Enter the drawing to win a mug! 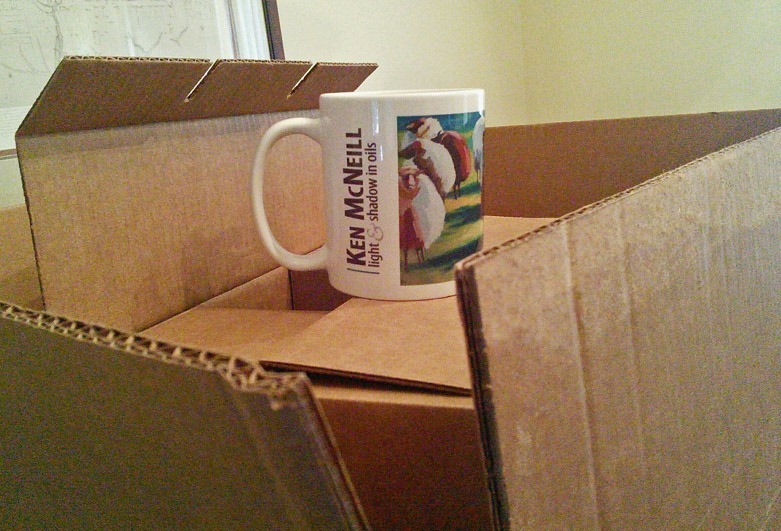 AUGUST 4, 2015 A box o' mugs has arrived! JULY 25, 2015 Save the Date! I'll be the featured artist next month atArtistic Expressions Gallery. Please join me Friday, August 14 from 6 to 9pm for a reception with art, music and food. JULY 12, 2015 New paintings are online. More sheep! More scenes from the northern Italian city of Bergamo! Look for them in my Country and Travel galleries. I have several paintings in varying stages of completion. Hope to show them soon. JULY 4, 2015 Hope everyone has a happy and safe Independence Day! APRIL 6, 2015 HIstory Unwound was my first retreat-type show and I loved it. Kudos to hosts Kimberly and Christopher Villareal, Trish Marickovich and other hardworking souls for organizing this excellent, inaugural event. 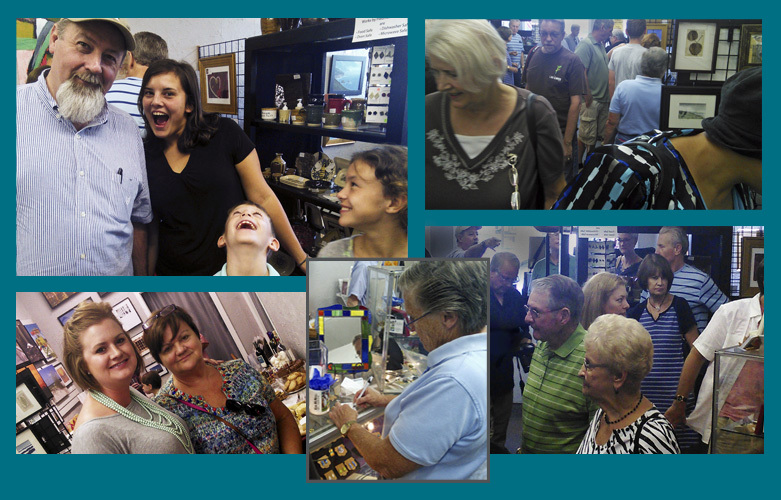 I enjoyed seeing familiar faces and meeting new folks. The Market Square offered a well-chosen collection of goodies for fiber crazies (you know who you are!). Unique yarn, spinning fiber, patterns, tools, accessories and art were abundant. 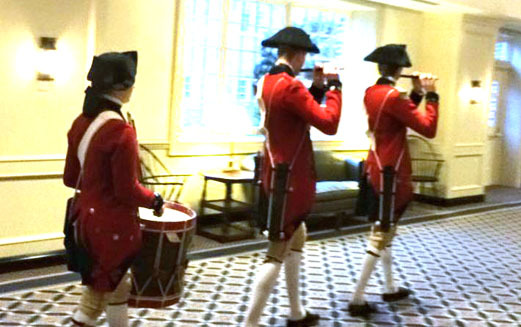 And where else but Colonial Williamsburg would you find a fife and drum corps parading a convention center? For a different perspective, read this post by PDXKnitterati (Michele Bernstein). She came all the way from Oregon to take classes and sit in on lectures. 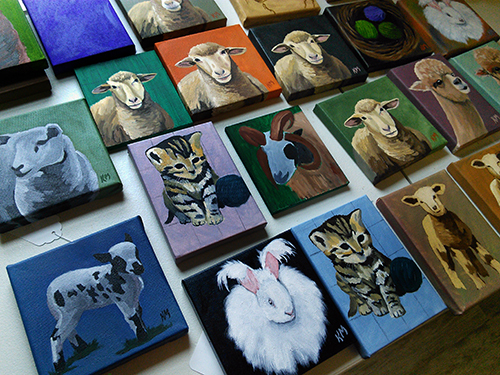 Michele is pictured above, holding a small sheep painting (second row of pics). 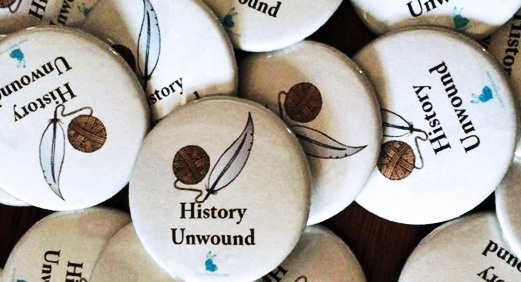 Many thanks to History Unwound and Tanya Holder Washburn for the use of their photos. Tanya and I go way back, waaay back, and I had the pleasure of meeting her husband Todd for the first time. Tanya is pictured above, with me (second row). MARCH 7, 2015 History Unwound will be in full swing by this time next Saturday. 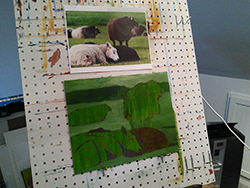 The above photo gives a sneak peek of small paintings in progress that I'm creating just for this event. MARCH 1, 2015 Happy March! It looks to be a busy month. I'm happy to be among the vendors invited to attend History Unwound, a three-day celebration of fiber history, discovery of and learning handcrafted textiles. Held in Colonial Williamsburg, a center for historical textiles, the event features classes, demos and lectures (plus the opportunity to rub elbows with rock stars of the fiber world!). You still have time to register -- the fun takes place March 13 to 15. Won't you join us? 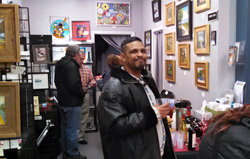 FEBRUARY 15, 2015 Artistic Expressions celebrated the evening before Valeintine's Day with a reception, Valentines at the Gallery. 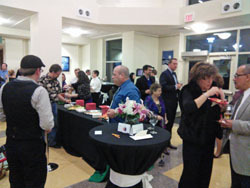 Red wine, chocolates and other goodies were enjoyed by those attending. The Gallery featured heart-themed art -- handmade creations especially suited for gift giving at Valentine's and throughout the year. Thanks to everyone who came out on a cold winter night. Great seeing you! 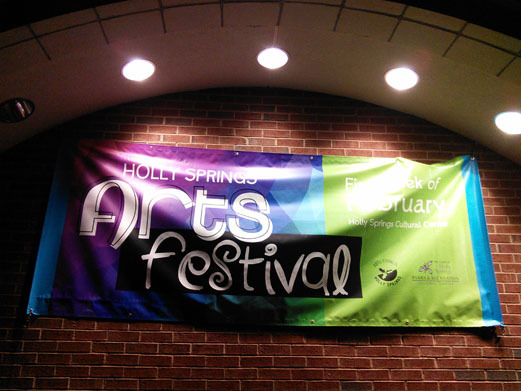 FEBRUARY 8, 2015 The Holly Springs Arts Festival Gala was a blast! Many thanks to the Holly Springs Arts Council for organizing this event. The fine art exhibit is on view through February 25. You still have time to see it! FEBRUARY 7, 2015 Tonight's the night! 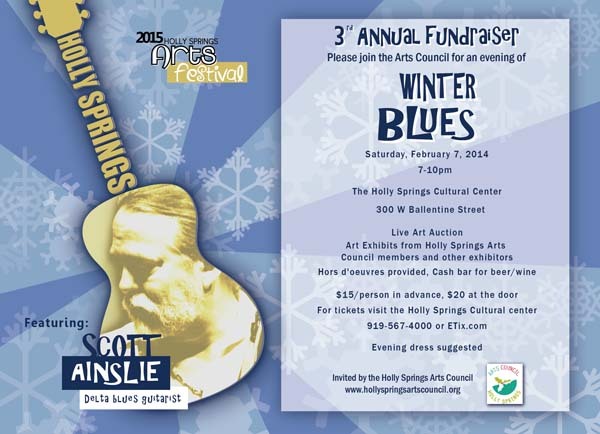 Feel the chill and sizzle of Winter Blues at the Third Annual Holly Springs Arts Festival Gala. 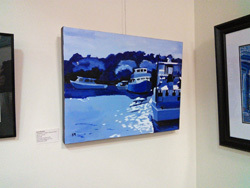 My painting "Calabash in Blue--Docked for Winter" was chosen by jury selection for this exhibit. JANUARY 25, 2015 Happy New Year! (better late than never?) My apologies for being away so long. I'm nearly caught up, after autumn events and the holidays, and looking forward to a couple events this spring. Stay tuned for details to come. I offer my sincere thanks for making 2014 an amazing year for me. I appreciate your support through purchases, website visits, Facebook likes and kind words. You're the best! OCTOBER 21, 2014 Art ala Carte is coming to SAFF! I'll be working until (almost) the last moment before we leave on Thursday for SAFF. Lots of new work--I hope you'll like it. Look for me in the Sales Arena, booth 19. 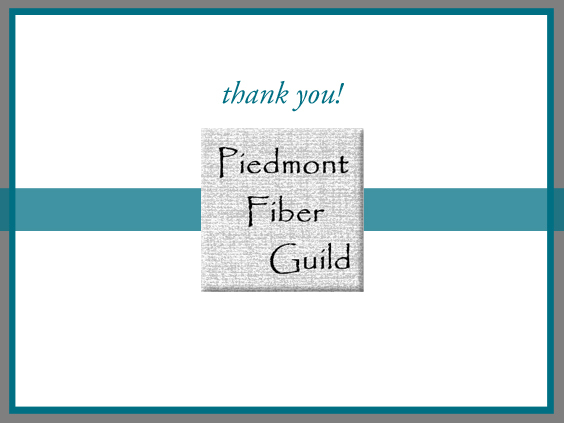 OCTOBER 20, 2014 Many thanks to members of Piedmont Fiber Guild for asking me to present at yesterday's meeting. 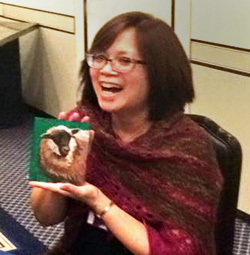 I enjoyed meeting y'all and having the opportunity to talk art and fiber! Piedmont Fiber Guild in Gastonia, NC, invited me to speak at its October 19 gathering. What's the topic? I'll cover my painting (!) 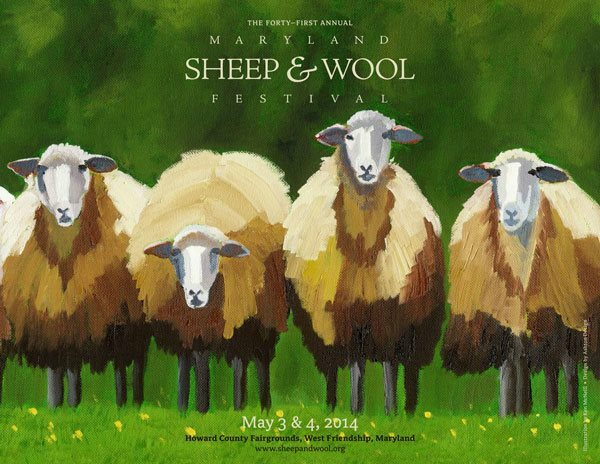 in general to painting fiber animals to my experience with this year's Maryland Sheep and Wool Festival. The Piedmont Guild has been around since the 1970s, evolving from a weavers' guild to one that encompasses all aspects of fiber arts. I'm looking forward to meeting these folks! Here's a sneak peek at my slideshow for the talk. 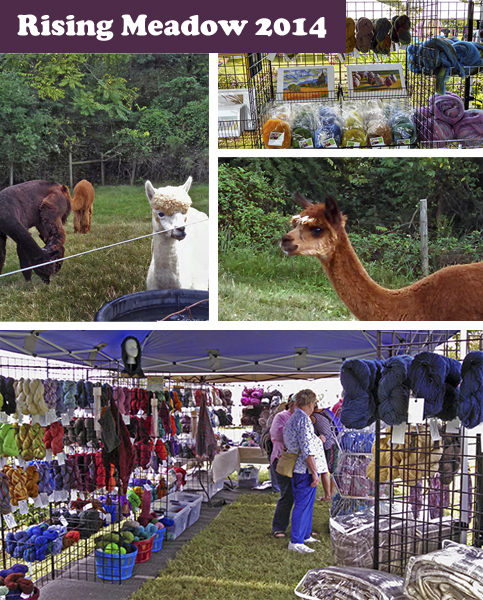 Southeastern Animal Fiber Fair will take place October 24-26, in Fletcher, NC (just south of Asheville). This year will be my first as a vendor., and we're putting the final touches on paintings and prints for the event. Look for me in booth 19 in the Sales Arena, next to Heelside Farms. Hope to see you there! It's a busy time of year. That's a good thing. OCTOBER 8, 2014 Look for our ad in the current issue of PLY Magazine! OCTOBER 7, 2014 I am pleased to be a vendor at the 2014 SouthEastern Animal Fiber Fair (SAFF). Look for Heelside Farms and me in the Sales Arena! Click for the SAFF event program. It opens as a PDF. 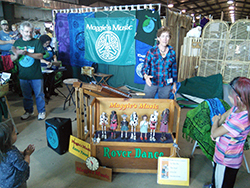 OCTOBER 1, 2014 We had a blast at Rising Meadow Farm Fest. 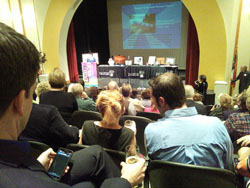 Many thanks to the event organizers and to everyone who attended. And we appreciate all the folks who visited our booth! One of my favorite things about events like this is meeting people and hearing their stories. This is a coming-full-circle story. 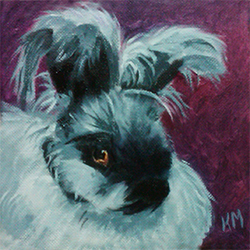 A couple of years ago I was commissioned to paint Hank, an angora bunny, and mascot of Two Knit Wits yarn shop. 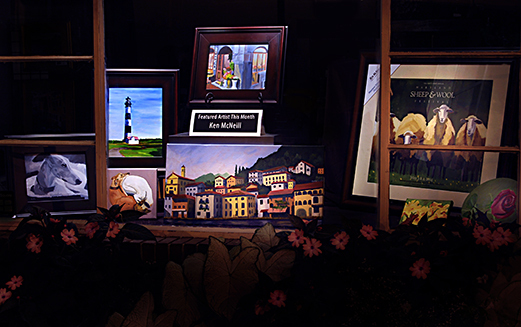 The shop owners' friends arranged for the painting; everything was done by phone, Internet and US mail. The shop closed and Hank went to live in the owner's home. Alas, the woman discovered she is allergic to bunnies. Hank now has a new home. 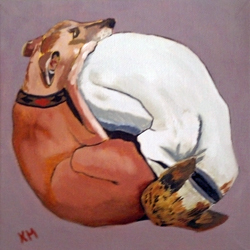 And, while she doesn't see the bunny any longer, the lady still has the painting. We met for the first time when she stopped by my booth at Rising Meadow! humming "It's a Small World..."
SEPTEMBER 27, 2014 Wondering how Art ala Carte works? It's as easy as 1, 2, 3.
forecast shows low 80's and partly sunny. Perfect! SEPTEMBER 24, 2014 Heelside Farms and I are so excited about Art ala Carte that we want to share a sneak peek with you. Above, my painting, Fleece of Dreams, is paired with this coordinating hand-dyed, hand-carded batt for spinners. Heelside's Carolyn Beasley did a beautiful job with the colors. 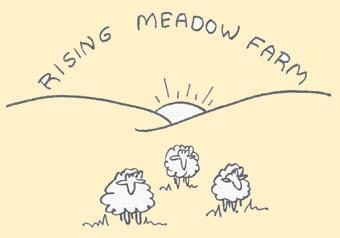 Only a few more days till Art ala Carte becomes available at Rising Meadow Farm Fest. 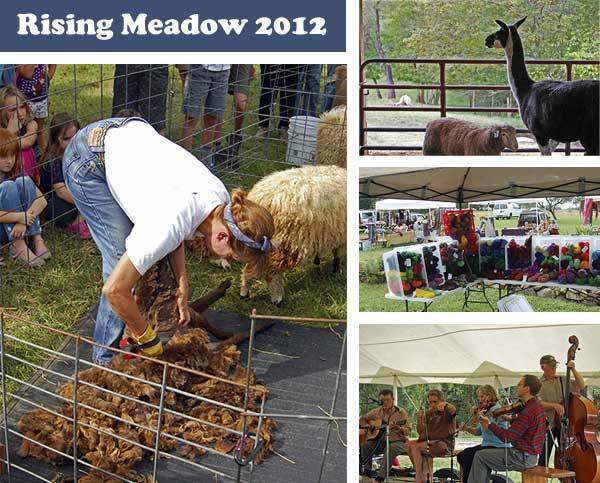 SEPTEMBER 23, 2014 I'll be at Rising Meadow Farm this Sunday for the twelfth annual Rising Meadow Farm Fest. A celebration of fiber and food, it features fiber animals, sheep dog demos, a sheep shearing demo, live music and great food. 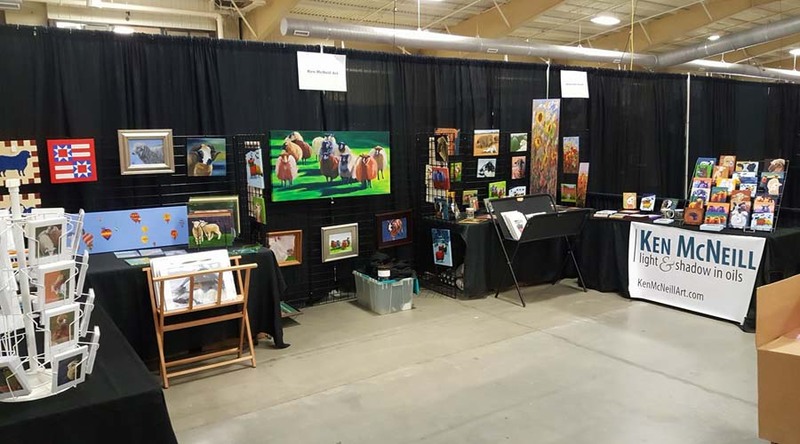 Fine artists and artisans will have unique and beautiful wares for sale. It's a fun, family-friendly event. Art ala Carte will available for the first time! Be sure to get yours. Look for it (and me) at the Heelside Farms booth. 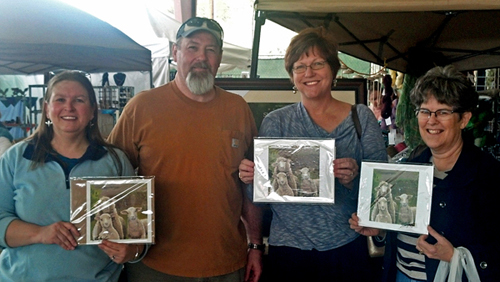 SEPTEMBER 21, 2014 Southeastern Animal Fiber Fair gave me a mention on its Facebook page today. Thank you! 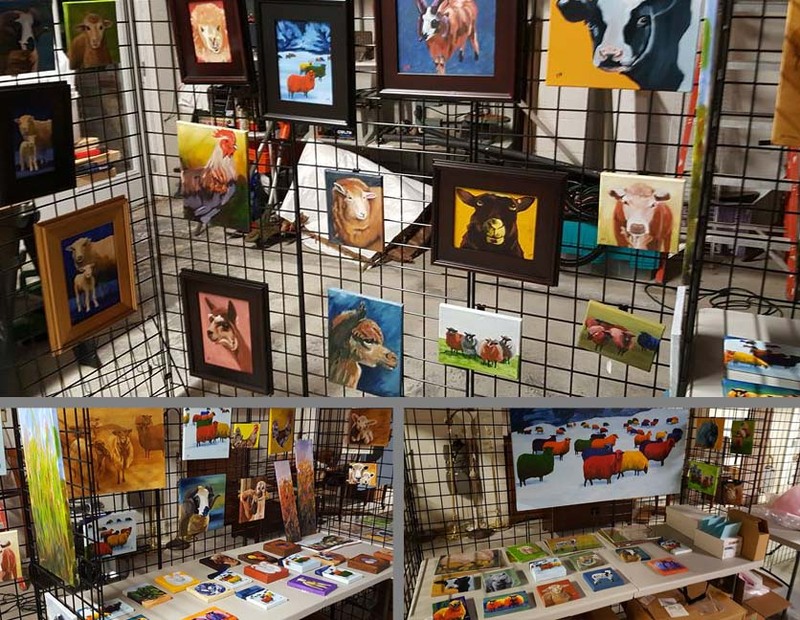 I'm excited about being a first-time vendor at this event, held Octobe 24-26 at Western NC Agricultural Center in Fletcher, NC (just south of Asheville). 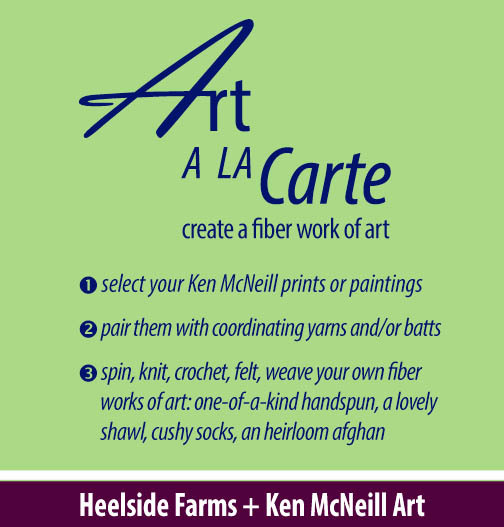 SEPTEMBER 15, 2014 Heelside Farms and I are teaming up to bring you Art ala Carte, a unique collaboration inspired by the love of color and fiber. Heelside’s newest line of exclusively dyed yarns and hand-carded batts puts the vibrant palette of my paintings at your fingertips.Knitters, spinners, crocheters, felters and weavers will delight in creating their own works of art. With Art ala Carte, you’ll select one or more of my works and pair that with coordinating yarns and/or batts. Think bold gold, bedazzled blue, café au lait, fresh lime and other colors to create one-of-a-kind handspun yarn, a lovely shawl, cushy socks, an heirloom afghan. 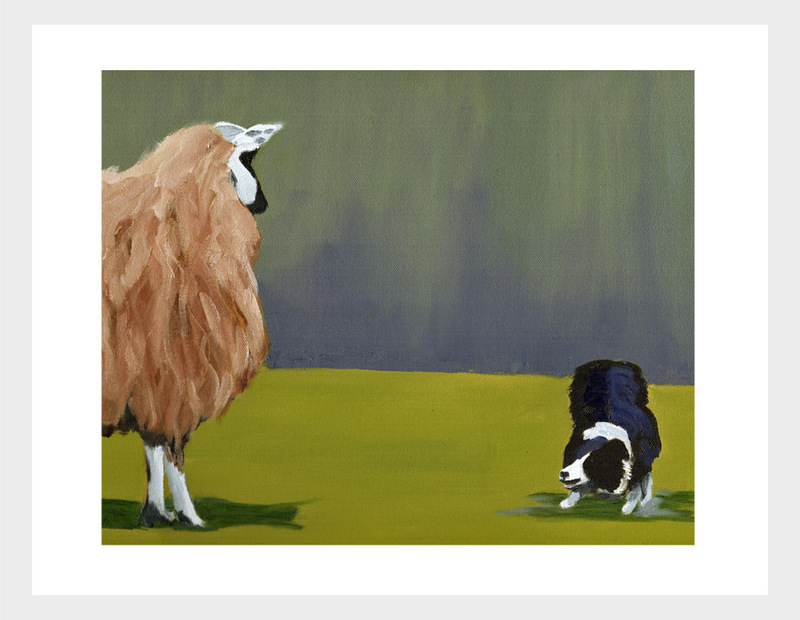 Home to a spinner’s flock since 2002, Heelside Farms offers a wonderful variety of fiber goodies from their Border Leicester, Finn, Icelandic and Cormo sheep. 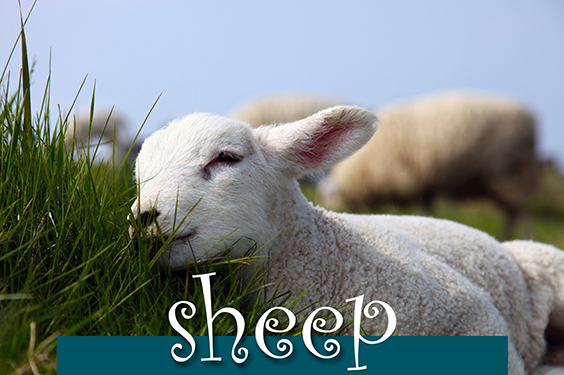 You’ll fall in love with blends of their wool combined with mohair, alpaca, angora and silk. 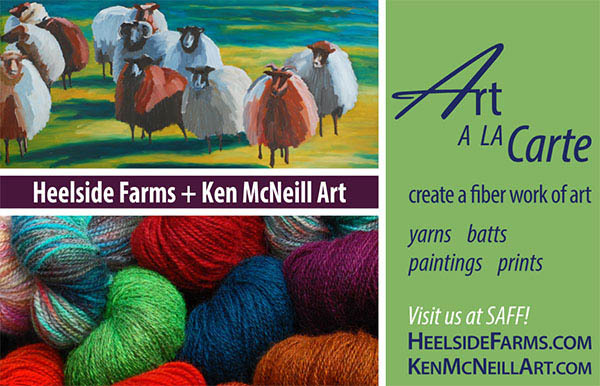 Heelside offers a complete range of fleeces and locks, spinning fiber and yarns, in natural as well as hand-dyed colors, for all your fiber needs. 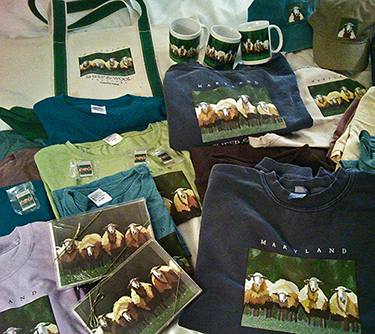 Art ala Carte will be available for a limited time, beginning Sunday, September 28 at Rising Meadow’s Farm Fest. Be sure to get yours! 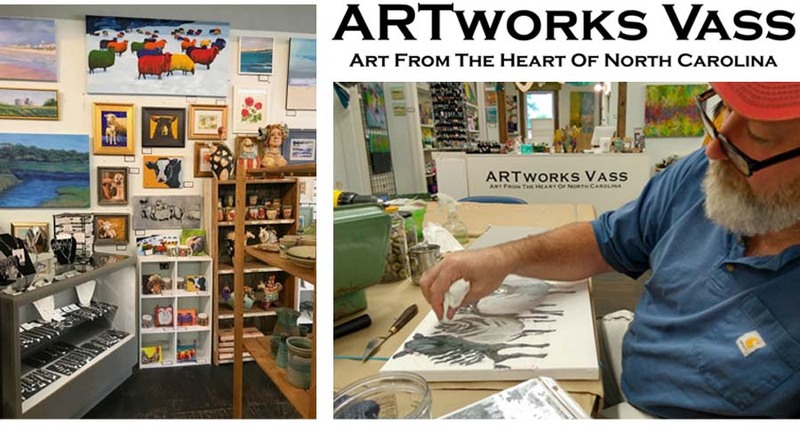 SEPTEMBER 11, 2014 Here's a look inside my studio and some paintings I'm working on. You'll notice I'm adding to the flock! 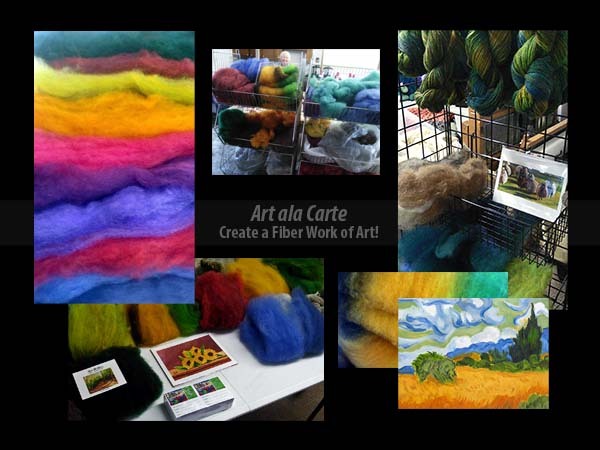 SEPTEMBER 5, 2014 Heelside Farms and I are pleased to announce Art ala Carte, a unique collaboration inspired by the love of color and fiber. Follow the link to Heelside's website for a sneak peek! SEPTEMBER 1, 2014 My time as Artistic Expressions' Artist of the Month was a pleasure. Thank you for supporting the arts! Mountain Vineyards and Winery for the delicious wines. We'll have to do it again! at the gallery on August 30, from 10 am to 4 pm. Hope you'll stop in to visit. being displayed inside. I'm excited to offer new paintings and prints. I hope you'll like them. Vineyards and Winery of Sanford, NC. ETA: Made the Southwest Wake News, print and online! every turn. I appreciate having been a small part of it. 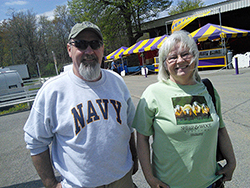 The purchase of Festival merchandise helps to ensure future events. Thank you for showing your support in this way. And special thanks to everyone who asked to have their items signed. I enjoyed talking with each of you. on the catalog cover, t-shirts, mugs, bags, stationery, posters and more! Visit the Festival's website and follow on Facebook for event details. Many thanks to the Festival for choosing my work. month. 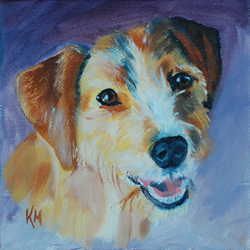 The painting is for my wife, in memory of him. the catalog cover, t-shirts, bookmarks, bags, stationery, posters and more! my sincere thanks to everyone who made the year a success for me. support. I'm excited to see how 2014 unfolds! field is shown here. It was a fun night of fundraising for a great cause. where I enjoyed meeting residents, their family and friends. brushes, and I painted a couple en plein air pieces. those who think they don't! yarn shop October 13 in Cary, NC. who mentioned my paintings on her blog, DestiKNITions. of Two Knit Wits in Oak Ridge, NC. Happy Birthday! 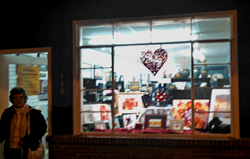 be seen at Cary, NC's new yarn shop, Warm n' Fuzzy I Yarn Love. commissioned by a client for his wife's surprise birthday gift. I hope she enjoys them as much I liked painting them. 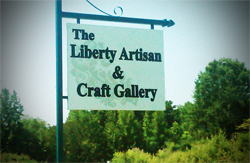 be seen at The Liberty Artisan & Craft Gallery, Liberty, NC. gallery owner, for handling the details. gallery for hosting the show and providing this opportunity. gallery will host a reception on Friday, March 30, 6 to 9 pm. I appreciate your interest and hope you'll visit my website often.